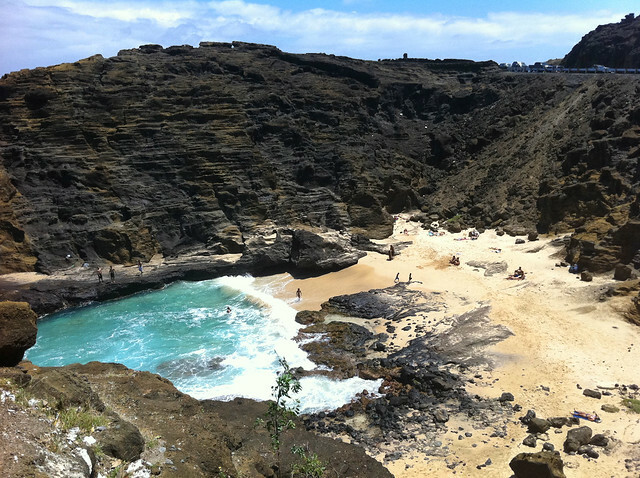 After traveling through Maui and the Big Island it was kind of difficult to adjust to Oahu. 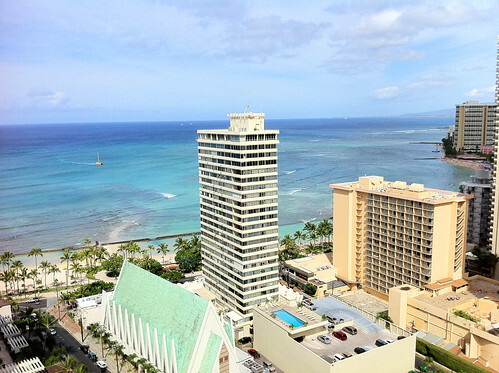 Most people that travel to Hawaii stay in the resort area of Waikiki which is in the giant city Honolulu on Oahu, which is where, like, 80 percent of the Hawaiian population lives. It was shocking after the emptiness of the big island to drop into such a busy place that is packed with tourists, the ABC general store, and tons of souvenir shops selling grass skirts, sunscreen, and hilarious t-shirts. Here is our view of the beautiful beach from our hotel room at the Marriot (quite a bit different than camping on the beach!). The water there is so beautiful. It sparkles and changes all day. One thing you might have realized about me is that I like a really slow pace of life so it was kind of overwhelming for me to be in the city. 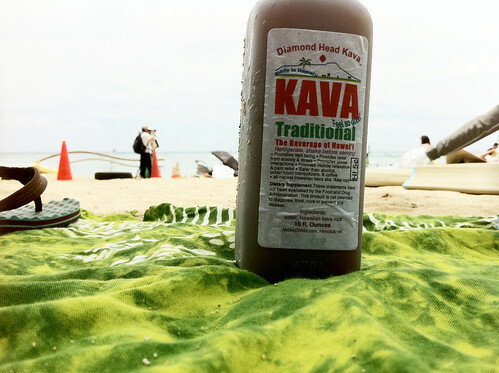 But I quickly got into a routine, breakfast at the healthfood store Ruffage where I would pick up some relaxing Kava, find someone of the beach playing a ukulele and set up. the water is so beautiful to watch and the beach is packed with little kids playing, surfers, stand up paddlers, boogie boarders, outrigger canoes, sailboats and every other beach activity you can possibly imagine. Unbelivably, you can still see fish and the occasional sea turtle in the crystal clear blue water. 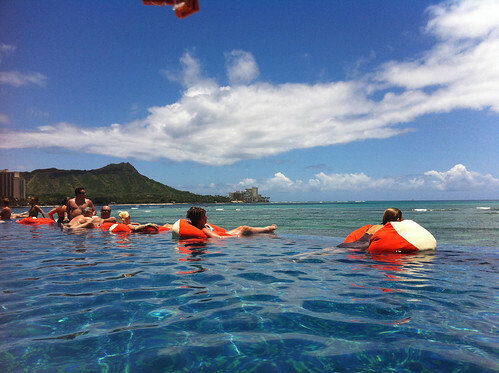 My favorite spot was at the infinity edge pool at the Sheraton, which is definitely where I will stay if I ever go back! You can even see turtles come up from the pool sometimes! 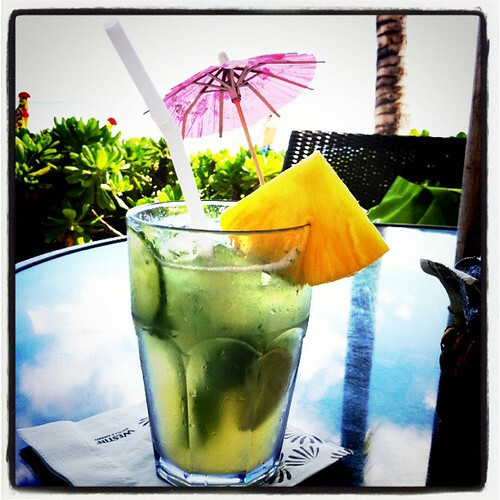 Hotels line the beach and serve the most wonderful cocktails you ever had in your life. The ripe tropical fruit makes all the difference, I promise. Other than the fabulous drinks I was really shocked by the lack of vegan food in Waikiki at first. It seemed like in the smallest towns on the other islands I had no problem finding something but in Waikiki it was totally different all the resorts cater to a sea creature eating crowd. My usual research of twitter, the ppk, and happy cow turned up a couple of teeny tiny health food stores (which do serve tofu scramble and sandwiches) on the beach and then lots of Thai and Vietnamese and a couple of places in Honalulu including the awesome Down to Earth health food store that has a fabulous buffet. The problem for me particularly was that I was with people that really wanted to eat seafood on the beach and the tourist places had nothing on the menu add to that that my mom doesn’t really like Thai & Vietnamese and you can see that I was in a pickle. For my first meal at the hula hut I had a salad and some mushrooms. And it cost like 30 dollars. 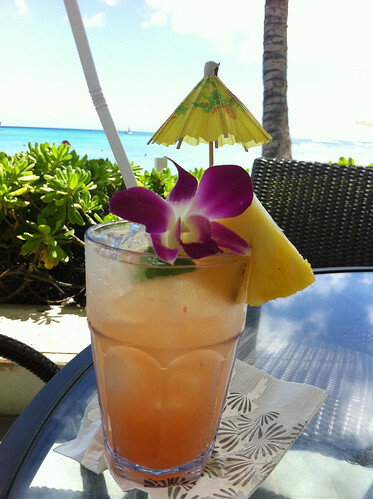 Lucky for me, the mai tai’s were fantastic and I had food at the room. 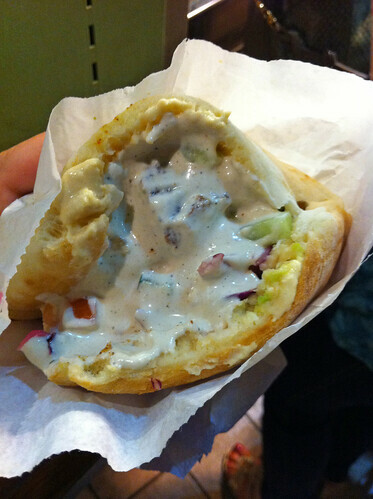 On yelp I found a stand called Da Falafel King that was right on the main street and I became totally smitten. God, it was the best falafel and hummus sandwich I ever had, and they were open til 2am and since it was kosher I didn’t have to worry about sneaky dairy! I went there at least 3 times. I would go back today if I could. My most surprising find was at Roy’s Hawaiian fusion, where when the waiter said, “oh would you like to see the vegan menu” um hello! Yes! It was a prix fixe menu with wine parings! 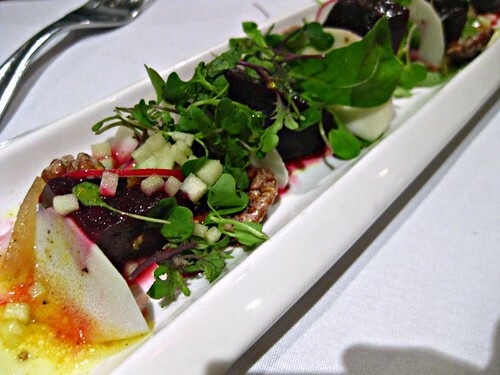 I started with the pasnip soup which was just fantastic and then had the roasted beet salad that was truly amazing, it had candied ginger and green apple curry dressing and I could have eaten 10. 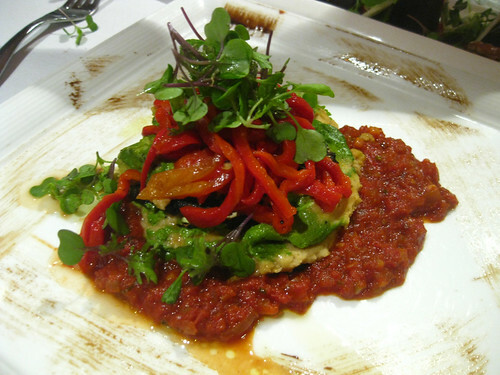 Then I had the main course, a grilled portabella and zucchini “lasagna”. I was super excited to try it because it had a tofu macadamia ricotta and crispy chickpeas but I really could taste either over the overwhelming taste of tomato sauce and hummus. I know it is a fusion restaurant but damnit, hummus does not go in lasagna just because you are serving vegans! 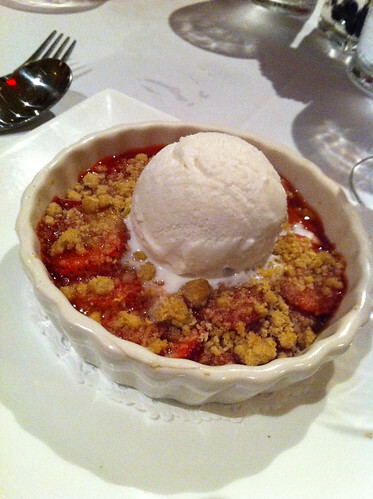 They made up for it with the dessert strawberry cobbler with oat streusel and coconut gelato. Another surprising treat was at Lulu’s Surf club where we randomly stopped one day for breakfast. 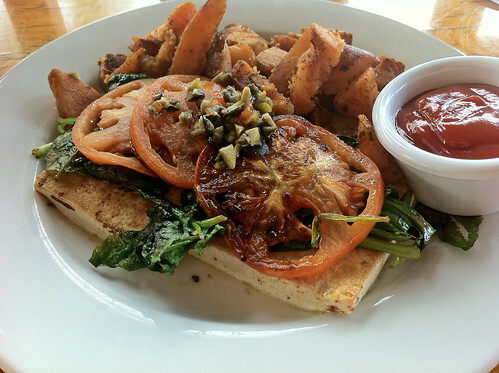 Imagine my surprise to find a tofu bennedict on the menu with olive tapenade, ie my favorite thing ever. They had other options too. I couldn’t believe I stumbled into it, and it was reasonably priced which most of Hawaii is most definitely not. there is a rocky path to go swimming down there which was really fun, if it hadn’t have been so rough you can go all the way out and see the Halona Blowhole from the water but the waves were tossing people around so I didn’t go in far. On the way back we stopped at the Bluwater Grill which, although seemed like a standard seafood place, had several vegan options. I got a Teriyaki glazed gardenburger with pineapple and fried maui onions, how Hawaiian is that! They even had malt vinegars for the fries and a super friendly duck so I was in heaven. 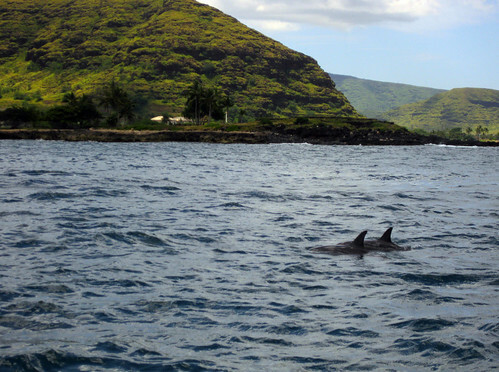 Another day I went to Waianae for a Dolphin Excursion snorkeling tour at the recommendation of my fried Jessica whose sister is the Captain and hilarious and a marine biologist. I am so jealous of her life! First you ride around looking for the spinner dolphins and then when they find a pod you get to slip into the water and try swim with them (without bothering them), they swam all around me! When Jenna told me that the dolphins were pregnant and in another week there would be little football sized babies swimming around I thought about just canceling my trip home and staying there forever but I knew I probably would have died of overwhelming cuteness. We went to another reef spot after that were I saw I think 7 sea turtles. God I love sea turtles. I want to become a turtle tracker. It is a new life goal. And I love fish. I love snorkeling too. And I love Hawaii I never wanted to leave you guys. Another day we drove up to the north shore. In the winter it is the home of all the big wave competitions but in the summer it is calm enough to snorkel at pipeline! 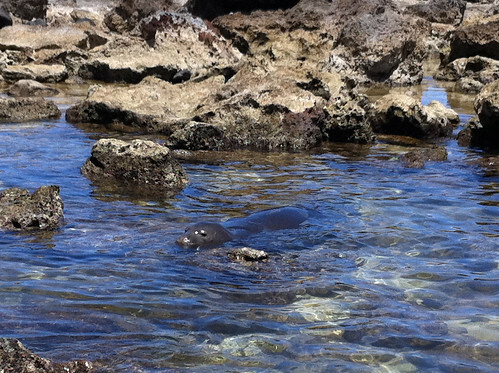 We snorkeled there at Shark’s cove where I was thrilled to see a monk seal just happen to come in and bask in the sun. Right across the street from shark’s cove they had a stand selling veggie Taro burgers but I went to another seafood place and had another salad. We also went to a few other beaches including goat island where I didn’t see one goat. Still, I know where I am going to stay next time! We decided to watch the stay and watch the sunset on sunset beach and it totally overwhelmed me that that so many people came to do the same thing. You know you are somwhere great when people’s days are spent with nothing more to do than watch the brilliant spectacle that happens every single day. Well, except in the pacific northwest where you forget the sunset even happens. So that is my story. This weekend I am going to make a Pineapple Cucumber Capiroshka and try and figure out if it is too late for me to become a marine biologist and listen to Hawaiian music in my hammock. 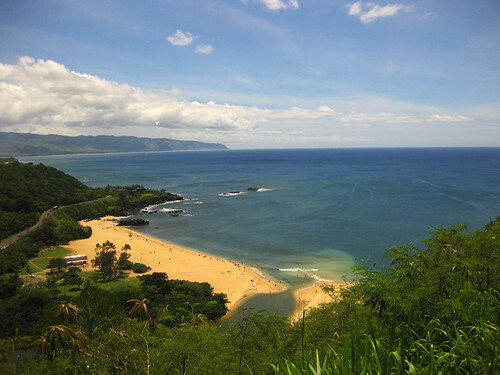 This entry was posted in Travel, US and tagged hawaii, oahu, vegan hawaii, vegan travel, waikiki on May 27, 2011 by lazysmurf. Thanks for sharing your adventure! 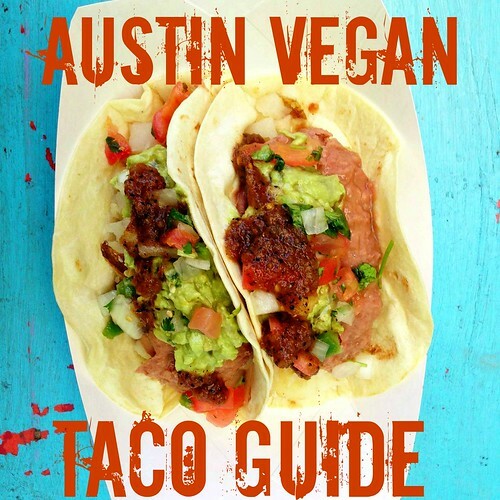 How wonderful you found all those vegan options in Waikiki and unexpectedly at that. 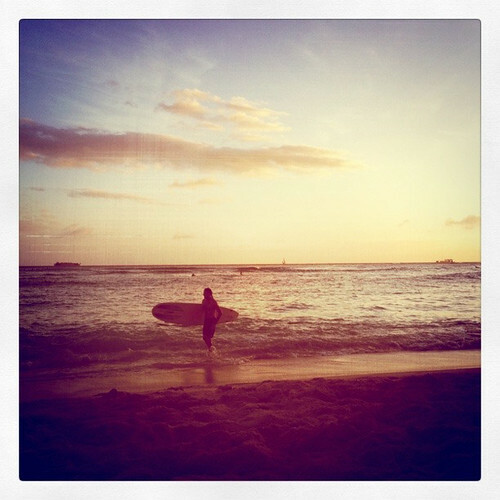 I love Hawaii too; you never want to leave once you’re there. It definitely makes an impression on the heart. I hope to be back again someday! Wow! Awesome pics. 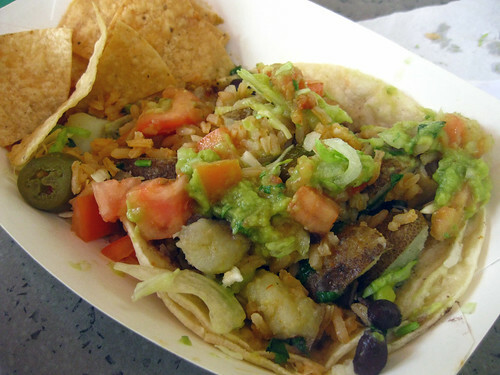 I forgot about Maui tacos…I love them! beautiful pics, i’d love to visit some day (although i would be scared to visit something called cockroach cove!) 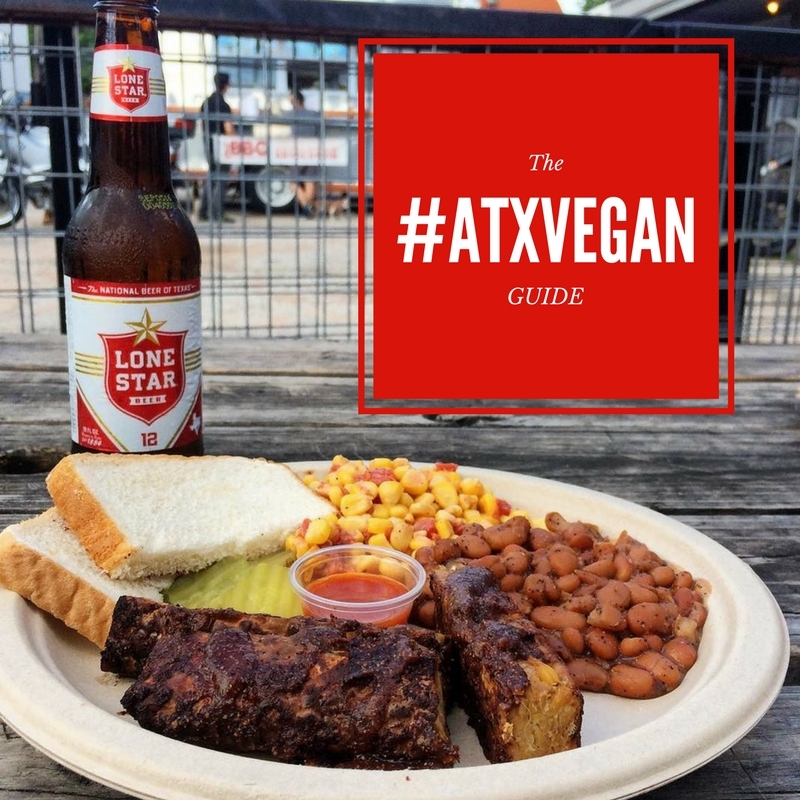 i’m glad you were able to find some vegan options! 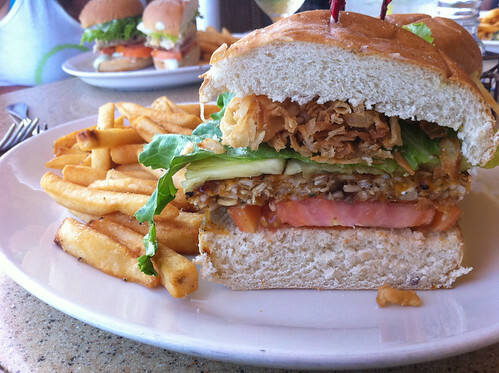 that pineapple onion burger looks awesome…the falafel, too. you have a lot of willpower, leaving before those baby dolphins were born. it would be almost impossible to resist that kind of cuteness! Wow, thanks so much for this. The pictures are a amazing and I share your love for dolphins. I think I will never be able to look at a dolphin without crying. 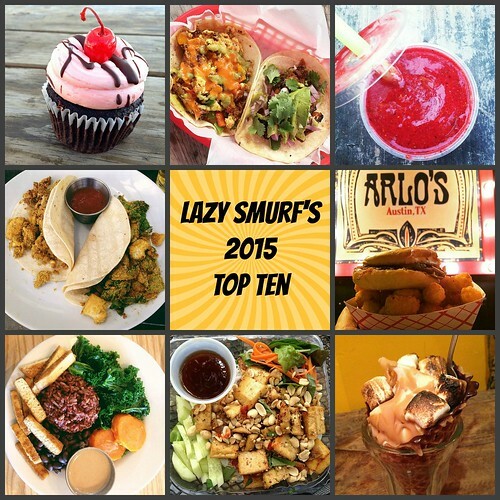 This blog makes me hungry and gives me the urge to cook. Awesome! I’m so excited about this post. The hubby and I are heading to Hawaii for a Wedding in less than two weeks and we’ll be staying in Waikiki. I’ll be sure to link back to you when I post about our trip. 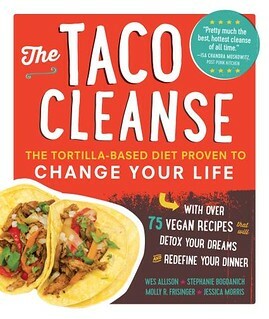 Angela, I am so excited for you!!! I hope you have a fantastic time! Awesomeness! Baby dolphins! Happy ducks! Sea turtles! What a rockin’ vacation. Sounds like I need to go to Hawaii just for the cuteness (and the cocktails). Wow! So glad you had a wonderful trip! 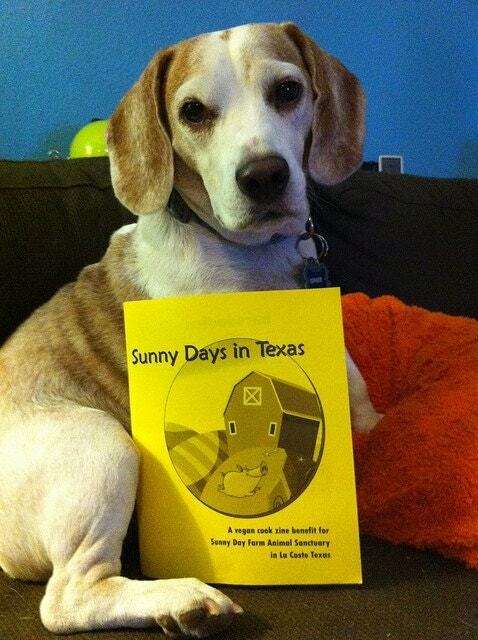 Thanks for sharing the pics and stories. Cockroach cove looks to be about the most gorgeous place I have ever seen! Meanwhile I was in NYC! I think you have inspired me to do my travel blog in the style you did yours instead of all pics and no words. 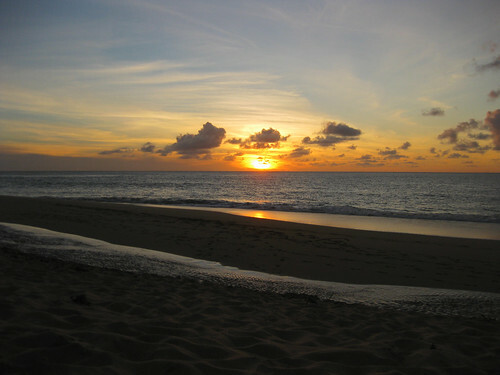 Waianae is my favorite part of Oahu! It’s so gorgeous out there. Football-sized baby dolphins would totally cause a cuteness explosion. 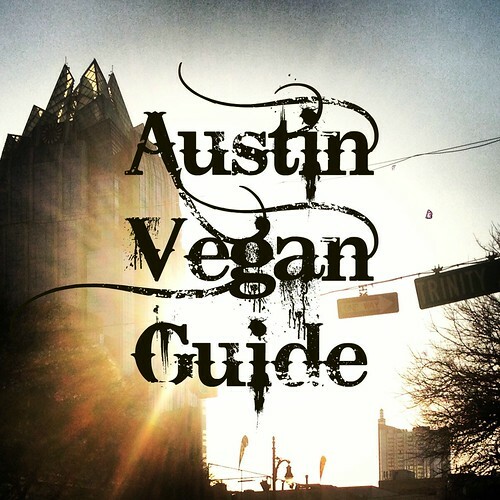 Great posts on your vacation (and vegan food availability)!